With the advent of cheaper travel offers, tourism has boomed almost anywhere in the world. Take advantage of the many teaching opportunities in the field of Travel and Tourism, and experience the joy of assisting professionals in this career. Topics covered include the travel industry and professions, learning styles and teaching methods for travel, needs assessment and materials development for the industry workplace. Travel and Tourism English also covers important areas such as cross-cultural communication, culture shock, and socio-linguistics needed for teaching subjects such as international relations. With full resources, vocabulary and lesson ideas this course will fully prepare the TESOL teacher for teaching in this ever growing and much in demand ESP (English for Specific Purposes) field. Q: Is previous travel experience necessary to teach in this field of English? 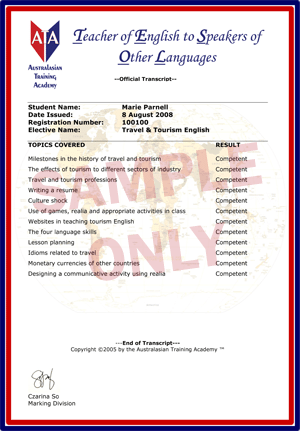 A: No, this course will cover all the information needed to teach Travel and Tourism English. Q: How will I know what professions are involved in International travel and the tourism industry? A: Travel and Tourism English contains all the information needed for the TESOL teacher to know and teach in all fields of this exciting industry.